Sorry about this one, all. We’ll be back to our regular story on Monday, but for today Courtney is heading home to get her wisdom teeth pulled out, so I had to step up. I’m looking at this in the morning right before I get my teeth pulled – I had no idea what Victor was doing. To be honest, I can’t believe he actually did it – he’ll rarely even show me his doodles, let ALONE draw something and post it on the internet. …And is there something wrong with me, that I genuinely thought this was cute and then “AWWWW’d” all over the place? Because I imagine these little random cute things happening between the characters all the time, but don’t know how or when we’ll ever put them into the comic. Anyway next time I talk to you I’ll have less teeth and less… wisdom? (Because I had so much of that before) And I’ll be on drugs! Oh ye of little faith! I seriously doubt it, as I’m gonna be on some medications. In fact, thanks to the meds it may be some of my most inspired art yet! Plus it doesn’t hurt that bad. The worst parts are the swelling and being able to eat only baby food, imo! Be careful, some of that stuff is powerful. Half a Percocet nearly made me faint. D: And it’s not like it was a big pill, either. It’s currently making me very, very chill. Like normally I’m an anxious person but this is just like, whoa. Yeah man. …but it’s also making me nauseous, like I’m just trying to eat some pudding and my stomach does not like it one bit. 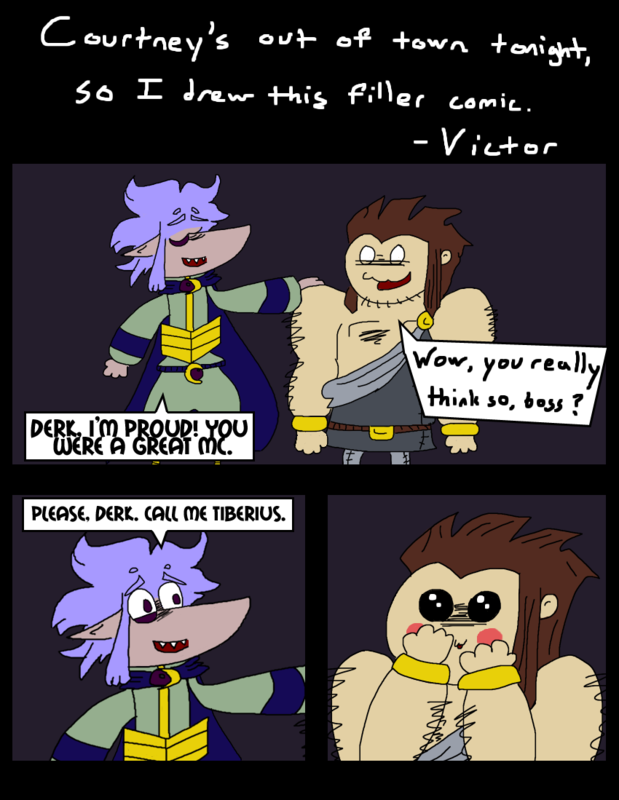 Derk’s face in the last panel is awesome. Oh dear! I do hope that the operation goes well and smoothly, and that you recover quickly! Eh the operation was over about five hours ago and I’m still bleeding slightly, this is getting old. But I’m not on the meds quite yet, Mom wanted me to get something in my stomach first, hence this banana milkshake I’m trying to get down while the back of my mouth and my throat feel all kinds of violated. skarva: DERKACHU, USE hydro-electrocution CANNON! The Gods were defeated! Skärva earned 1500 ides! Sorry for the delay in response – I do hope that you’re at least starting to feel better by now! That wasn’t even a quest; it was just a random trainer battle with your rival. I really do love it baby, I’m happy you did it. It’s like a get-well card to me, to see you draw the characters. This is ADORABLE. Victor, excellent work. Courtney: I don’t know you like at all, but get well soon anyway! Victor: Well done my man, well done.